It just takes a minute. It furnishes tremendous health rewards for those who eat it regularly. Many of us who have done a personal three-month RiSoTriene experiment of eating RiSoTriene daily have come to know that eating RiSoTriene daily is among the best things we have ever done for our health. We have come to believe after considerable experience with RiSoTriene that rice germ and bran excels virtually any other single food in terms of nutrient density, meaning how many nutrients one gets in proportion to calories supplied. That’s because RiSoTriene contains only rice germ and bran — it avoids the starchy part of the rice kernel where the excessive amounts of calories are located. So, RiSoTriene is naturally nutrient dense. If you tried to eat rice to get the same nutritional benefits of eating RiSoTriene, you simply couldn’t eat enough rice in a whole month to equal the rice nutrition that you will get in a single canister of RiSoTriene. By adding a natural Superfood like RiSoTriene to your diet, you are accomplishing much more good for yourself than are those people who take vitamin products. Man-made vitamins are the big reason why America spends more on nutritional products than any other country in the world, but its people have the among the worst health of all industrialized nations. The fact is that the body needs food because it is both balanced and it is recognized by the body as food. Vitamins are neither of the above and therefore, oftentimes create more work for the body to discard the unusable vitamin isolates. Nutrient dense food like RiSoTriene, and not vitamin isolates is the path to health. From Atkins diets (high protein) to vegetarian diets, RiSoTriene is the perfect addition to your health regimen that everyone can use. It’s high quality protein and low carbs are always right for everyone, from babies to geriatrics, athletes to those recovering from illness. Rice protein is considered by nutritionists to be among the best protein you can eat. And, it’s complement of antioxidants, phytonutrients and fatty acids excels anything you can add to your daily diet. A researcher named Patty Mayhew, while visiting India, learned from the locals that mothers in India have long believed that rice bran could help to uniquely nourish their ill children. In rural areas of India, white rice (as everywhere else in the world) is prepared by milling off and discarding the nutritious bran, while the white starchy grain that remains is used for food. The prime reason for milling the rice is because brown rice goes rancid quickly. So, it was tradition in rural areas of India, that when a child or relative was sick, a mother would go to the local mill and seek out freshly milled rice bran from the discards. The mother would them prepare a gruel from the bran and feed it to the sick child, who would often recover. This was the impetus for Patty Mayhew to start researching methods for stabilizing rice bran and germ. The reality of RiSoTriene is that it is a new food for humanity. Simply put, RiSoTriene is rice germ and bran that stays fresh long enough for people to eat it before it is rancid. The nutritional superiority of rice bran has long been known. However, within hours after milling, oxidative changes render the rice bran unfit for human consumption. An enzyme called lipase combines with the oil in the rice bran, turning the oil rancid. The result — nutrients are lost and the oil undergoes chemical changes to become toxic. Sixty million metric tons of rice bran are discarded annually worldwide due to this rapid development of rancidity. Scientists and others have made repeated attempts over the past 50 years to inactivate the lipase and thus stabilize the rice bran, but until recently a non-chemical, not-heat-destructive process eluded them. Now, for the first time in the history of the world rice germ and bran can be converted to RiSoTriene within seven seconds of the milling process. RiSoTriene has a shelf life of over one year. One day, RiSoTriene will be known as one of our greatest nutritional discoveries. Potential benefits of RiSoTriene (soluble, stabilized rice germ/bran). Is believed to help the body correctly process bad LDL cholesterol and triglycerides. Is believed to be of great value in terms of slowing down aging by combating one of the main causes of aging, namely free radicals because of its numerous antioxidants (antioxidants quench free radicals). Bolsters energy, muscle power and stamina due to its highly absorbable super B vitamins like ferulic acid and Pangamic acid, the Russians' secret athletic performance booster. Is very healing to many tissues of the body. The most common anecdotal report we get about RiSoTriene is in regard to skin conditions clearing up, including scarring, psoriasis, eczema, dry hard skin, etc. Each 12 gram serving of RiSoTriene has the nutrition from one pound of original paddy rice, but only 55 calories. RiSoTriene is UNcooked. Cooking destroys many delicate nutrients, which is part of the reason that RiSoTriene is so “healing” and nourishing to the body’s cells. The body knows how to use the nutrients in RiSoTriene because it is food, not synthesized vitamins. Laboratory synthesized vitamin isolates present a challenge to the body because they are incomplete or unbalanced which creates additional work for the body, which must scavenge the need balancing nutrients in order to use the vitamins. RiSoTriene helps the body to utilize fuel better. It helps move sugar molecules into cells and out of the blood, thus helping to lower blood sugar. This makes it a great food for diabetics, hypoglycemics or people with energy crashes and mood swings. RiSoTriene is particularly nourishing to two particular parts of the body... the skin and the nerves and brain cells. The reason is that the skin is constantly attacked by free radicals (the skin being the first defense system the body has against the world). RiSoTriene has over 100 distinct antioxidants. And antioxidants work best in teams. RiSoTriene is a great antioxidant team all by itself. The second reason is that RiSoTriene is a cell proliferant, that is it helps cells repair themselves more quickly. This is so important with slow-repairing nerve and brain cells. RiSoTriene is the foundation of Seven Essentials, which product adds six other types of nutrient dense food to RiSoTriene to create a Super, Super Food. You may need to lower blood sugar medications, so please work with your health professional. You may have Herxheimer reactions (die-off from fungi), which can be uncomfortable. Again, please proceed slowly to increase your dosage and/or work with your health professional. It contains very few calories (55) so it can be eaten as a part of a virtually any diet regimen. But, is not a substantial source of calories. It is a dry powder, hence, it may tend to dry out the stool unless you drink extra water. RiSoTriene is a fantastic, health supporting food. It is comprised of 100% uncooked, stabilized, soluble, predigested rice germ and rice bran. It is an incomparable health-supportive food for newborn babies, centenarians, and everyone in between. It contains only 55 calories per serving, but provides huge amounts of nutrients (but, without the calories). By supportive, we mean that the natural, nutrient tools in RiSoTriene can be used by the cells of the body as a toolkit or as building blocks that the cells of the body can use however, they choose. Unnatural products (i.e. prescription drugs, override the cell’s choice and force a reaction in the cell. That’s why we believe natural is better. For most of earth’s history, the majority of nutrition in rice was “inaccessible” — completely locked up inside the germ/bran. RiSoTriene’s superb nutrition — was unavailable through most of earth’s history because separation of the bran and germ from the white part of the rice kernel (unless cooked or chemically treated) causes rancidity to result in just a few hours, which meant that the carbs and nutrition had to be eaten together. Until a little over a decade ago, no one knew how to separate the germ and bran from the remainder of the rice kernel without destroying the fragile nutrition in the rice germ and bran! Now, the technique for doing this has been perfected, and as a result, a single spoonful of RiSoTriene supplies more assimilable, balanced, food-form, health-improving nutrient tools than your body may have ever had access to before. The main reason RiSoTriene is so supportive to health is that is provides nutrients without damaging, excessive calories or extra work to be performed in order to obtain nutrients. RiSoTriene is a gentle, giant supply of easily obtained nutrients. On the other hand, vitamin isolates are unbalanced and insufficient and so when one consumes vitamin isolates, the undersupplied nutrients have to be scavenged from the body, or else the oversupplied nutrients have to be discarded. Either way, this is needless work for the body to do. That’s why we recommend RiSoTriene several times per day. Click to Listen to an Audio Interview About RiSoTriene! White rice is the most commonly eaten food in the world. Yet, most of rice’s nutrition is in the brown part that is thrown away. And, when do eat the more nutritious “brown” rice, they cook it, and destroy the tremendous, but fragile nutrition in the germ and bran. In the first case, the case of only eating the white part of rice, one misses all the nutrients in that part of the rice that has been milled off and thrown away. That throwaway part contains 70% of the total nutrition in the rice kernel. In the second case, cooking the whole grain rice before eating, most of the fragile nutrients are killed by cooking. Of course, the carbs aren’t killed. But, how many carbs do you need? If you’re like most people, you’re overfed on carbs, but underfed on nutrients. This picture shows paddy or whole rice and milled or white rice. Interestingly, the brown part of the rice kernel makes up just 8% of the rice kernel yet it contains two thirds of the nutritionist. That makes it 20 times more nutrient dense than the white part. Here is a blowup of a Rice Kernel showing the bran and germ from which RiSoTriene comes. The bran and germ of the rice kernel contains 2/3s of rice’s total nutrients, but comprise only 8% of the mass of rice.. Most people in the industrialized part of the world get plenty of calories/carbohydrates, i.e., fuel. We are, in fact, virtually always overfed on calories. At the same time, however, we are almost without exception undernourished in terms of nutrients, the building blocks that maintain our cells in good operating condition. Since the white part of the rice contains most of the calories and the brown part contains most of the nutrients it would be desirable to separate these two parts and focus our efforts on eating more of the nutrient dense bran and germ. Unfortunately, until recently it was not possible to separate the germ and bran from the starchy part of the rice kernel because when separated the rice bran goes rancid within just hours of being separated. But, recently a process for stabilizing the nutrient dense part of rice was perfected. This process involves mechanical extrusion of the rice germ and bran, breaking the lipase enzyme which causes the onset of rancidity. So, now, the nutrient dense portion of the rice kernel can be separated without rancidity occurring. With this discovery, for the first time in the history of man, rice’s tremendous nutrition is available without having to also eat all the carbohydrates in the whole rice kernel. A person would have to eat a car load of white rice to equal the nutrition in a single canister of RiSoTriene. For vitamin pill takers, take note that because RiSoTriene is a food, rather than a vitamin supplement, it contains numerous natural vitamins and other nutrients that man-made supplements can NEVER furnish. RiSoTriene is a granulated powder that is extracted from the outer layer of the paddy rice kernel in a three step process. The germ and bran are stabilized by fracturing the lipase enzyme that otherwise causes rancidity. Insoluble fiber is removed via filtration. What remains is then predigested — so that it is virtually perfectly assimilable by everyone. The nutrients in RiSoTriene become part of a cascade of building blocks and signals provided to your body’s cells to “repair” themselves. RiSoTriene is the best source of Gamma Oryzanol, an important nutrient that is believed to naturally accelerate healing of bodily tissues. By eating RiSoTriene, your body’s natural healing capacity will be accentuated and will feel better in many ways! So, we invite you to learn about the discovery of RiSoTriene and why it is one of the most nutrient-packed foods on earth. You need to try it. Once your body discovers RiSoTriene, you won’t want to live without the increased energy and wellness its daily use offers. RiSoTriene feeds your body more raw nutrition than you can get in perhaps any other way. This is so important because over the long haul, excellent nutrition is the best ensurer of health. RiSoTriene is FOOD! and provides us with numerous nutrients that scientists will never be able to synthesize — in a balanced format that doesn’t cause extra work for the body to utilize. RiSoTriene contains very few calories (55 per serving). RiSoTriene is gluten free. So, even people suffering from IBS and celiac disease can eat it. RiSoTriene tastes great in water/juice or mixed in food. RiSoTriene is powerful for assisting cells and tissues of the human body with tools and nutrients to be used in their process of healing or regeneration. It naturally contains Gamma Oryzonal, one of the most important group of healing nutrients known to man and the subject of numerous use-patents Gamma Oryzanol instructs the cells to repair themselves. RiSoTriene is an antioxidant power house with numerous distinct antioxidants. Antioxidants work better in teams and in RiSoTriene there are at least 107 distinct antioxidants including numerous powerful tocotrienol antioxidants. Tocotrienols are more mobile and more reactive than other antioxidants. So, in this sense they’re better. They have been shown in some preliminary studies to reduce the risk of atherosclerosis. Also, tocotrienols have been shown in some preliminary studies to reduce the risk of breast cancer by over 90%. The least potent antioxidant of RiSoTriene is sixty times more potent than Vitamin E and the most powerful antioxidant in RiSoTriene is 6,000 times more potent at neutralizing free radicals than Vitamin E.
RiSoTriene is great for enhanced athletic performance because it contains a powerful comprehension of natural B-Vitamins (rice is the source of many if not most B-Vitamin products) that have been shown to increase energy and stabilize blood sugar (including those B-Vitamins that cannot be synthesized in a laboratory such as Pangamic Acid or B-15, that has been called the Russian athletic performance secret. Another outstanding characteristic of RiSoTriene is that it contains all of the amino acids to help maintain organs, glands and tissues. RiSoTriene is highly digestible and assimilable. It is hypoallergenic (new born babies, allergic to their own mother’s milk, have thrived on it). RiSoTriene is prepared with quality standards that go beyond ordinary food and nutritional products — every batch is tested for residue of pesticides and chemicals before and after processing. 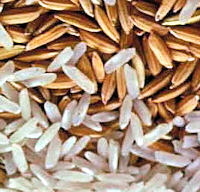 The bran and germ from which RiSoTriene is captured comes from rice grown in Montana and California’s Sacrament Valley within 7 seconds of milling. This nutrient dense portion of the rice kernel is then stabilized via extrusion and further filtered to remove insoluble fiber. Click here to read this book (in pdf format) for free. (It’s regular price is $4.95). RiSoTriene can be eaten dry right out of the canister or added to any liquid (that is not hot enough to burn the mouth). It can be sprinkled on salad, mixed into cottage cheese or breakfast cereal. Adults typically consume 1 to 4 scoops of RiSoTriene per day, depending on whether maintenance or restorative nutrition is the goal. Some people have eaten up to 10 scoops per day with no problems. We recommend that everyone, however, start with 1/2 scoop their first day and work up slowly to allow their bodies to get used to so much nutrition. Note that RiSoTriene is created from the out layers of the rice kernel and is very concentrated. Since nature packs anti-fungal properties into the outer layers of grains to protect the grains while growing in wet ground, that means that RiSoTriene will have an anti-fungal effect in the body . Eating large amounts of RiSoTriene at first will cause a Herxheimer reaction - die-off of fungus in the body. This die-off is a good thing, but can overload the eliminatory pathways of the body at first and could make one feel worse at first. That’s why it’s best to start with small amounts and build up, so as to avoid a large and rapid die-off of fungus. Tocopherols and Tocotrienols (220-320ppm) Tocopherols and tocotrienols belong to the same chemical group but exist in 10 different isomeric forms having different antioxidant properties.